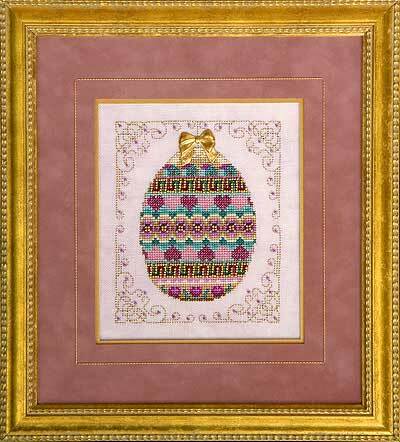 décor with this exquisite egg that’s anything but ordinary. Stitch just one or collect the set of four. Each one is unique, yet they complement each other beautifully with a full range of pastel colors to celebrate the Easter season. A different brass bow is provided for each design. GP-118 – Egg Elegance No. 1 – Stitched on Zweigart’s Vintage Country Cream in shades of lavender, spice and topaz. GP-119 – Egg Elegance No. 2 – Stitched on Zweigart’s Vintage Blue Whisper in shades of violet, magenta and electric blue. GP-120 – Egg Elegance No. 3 – Stitched on Zweigart’s Vintage Antique Green in shades of mint green, peach and light mocha. Fabric: Stitched on 28 count Pink Whisper (Item #3281/4099) Vintage Cashel Linen by Zweigart. Materials Summary: A total of 14 Anchor colors used in model. DMC comparable (best match) colors are provided in chart. Chart includes brass bow embellishment. Attach beads with transparent Nylon Thread or use 1 strand of floss that most closely matches the fabric color.